Fashion is a fickle little minx that will seduce with glitter and glamour, flatter your ego, then kick you to the curb and laugh derisively while your bloody nose drips into the gutter. At least that's the message I divined from Ultrasuede: In Search of Halston, a documentary that examines the life of the man whose stunningly simple fashions served as both a visual hallmark of the disco-era and a harbinger of the fuss-free outfits we all enjoy to this day. 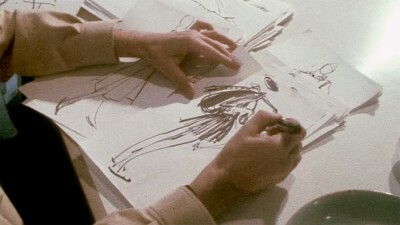 While the film explores Halston's brilliance as a designer decently enough, director Whitney Sudler-Smith is too invested in making the film a personal statement - the journey of a jaded hipster seduced by the hedonistic aura of the '70s - to step aside and let his subject speak for himself. 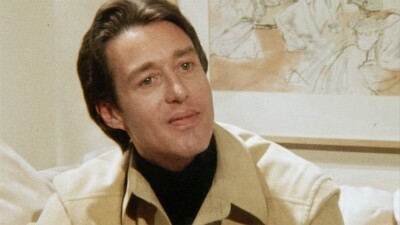 Ultrasuede: In Search of Halston is framed by Sudler-Smith's own impressions of the designer - he appears on camera throughout the film, narrating and serving as a regular-guy surrogate for the average person who may vaguely know Halston from a long-ago song lyric or his connection with the Studio 54 disco scene in the '70s. Yes, it's one of those films whose very premise depends on how well you can relate with its main personality. Putting it mildly, Sudler-Smith is no Michael Moore or Morgan Spurlock. Immediately he establishes a strange persona that is part fashionista, part good 'ol Southern boy, occasionally sporting an ironic handlebar mustache and tooling around Manhattan in a souped-up Pontiac Firebird, the kind of wheels that a random Dukes of Hazzard cousin would feel at home in. What exactly fascinates him about Halston is never really made clear; it's merely the guy's image as a trend-setter and icon of the decadent side of the '70s that has an irresistible pull on the filmmaker. The tact that Sudler-Smith takes with this film is disconcerting, but he does possess some charm (in a smarmy way) and one can see how Ultrasuede could have been pulled off with a solid mission and the right direction. Unfortunately, the film kicks off on the wrong foot with Sudler-Smith proclaiming that the designer is "forgotten" and is ripe for rediscovery. Although bad business decisions kept Halston's name purely in the realm of '70s-'80s fashion (unlike what transpired with somebody like Gianni Versace transferring the business to trusted family and associates, the fashion house bearing Halston's name petered out around the same time he perished of AIDS in 1990), the man and his work are still well-respected and fondly remembered. Even among young designers who weren't yet born during his heyday, his accomplishments are far from forgotten. To prove his point, Sudler-Smith tracks down the Halston archives, which are oddly stored in a forgotten room in Tennessee's Christian Lipscomb University. He also tracks down Halston's plaque in the fashion walk of fame in New York's fashion district - not exactly forgotten, but why split hairs? The bulk of Ultrasuede consists of Sudler-Smith trekking around Manhattan and interviewing various people who were intimates of Halston, folks who greet the filmmaker with varying degrees of openness. The first interview subject presented is Halston's famously close pal Liza Minnelli (a big plus, and the clear highlight of the doc), who comes across as a warm, unpretentious person who genuinely loved her friend. Minnelli soundly advises Sudler-Smith to avoid going the easy, trashy route and get to the generous man that she knew. To be fair, it does portray a balanced overview of Halston's life and career, illustrated with slick motion graphics and an evocative soundtrack of '70s pop hits. He also manages to wrangle down a lot of interesting people with deep connections to Halston. In addition to Minnelli, the subjects include André Leon Talley of Vogue magazine, fashion designer Chado Ralph Rucci, Bob Coachello and Glenn O'Brien from Interview magazine, model Pat Cleveland and actress Angelica Huston. An impressive array, and he does get a lot of good, heartfelt recollections from them. As with the rest of Ultrasuede, the interviews work despite the fragmentary nature of the film. For a project about a guy whose perfectionism extended to his luxe condo and the mirror-walled, state-of-the-art office he maintained, this sure is a messy patchwork. Sudler-Smith seems to be a big fan of filming the circumstances of his interviews, much to the detriment of both interviewer and subject. For example, a cursory chat with socialite Georgette Mosbacher spends as much time with the fussy decor (and her fussy assistant) in her sitting room as with the lady herself. As indications that the filmmakers ran out of material to fill out 94 minutes, the film goes into some odd detours. This includes a longish part delving into the decadent culture of Studio 54 (where Halston frequently hung out, but it wasn't very relevant to his life or career) and completely pointless interviews with musicians Billy Joel and Nile Rodgers. Apparently writing song lyrics that name-drop a person makes you an expert on that person? If it sounds like I'm totally trashing Ultrasuede: In Search of Halston, that may be too broad a judgement. The film is an enjoyable, somewhat shallow overview that cleverly uses tons of intriguing found footage and news clips (including Halston's campy appearance on The Love Boat, a moment I remembered well as a tyke) tied together with a fun if too-pat soundtrack. In order to fully get involved with it, however, one has to get past Whitney Sudler-Smith and his noxious behavior. In the course of the film, Sudler-Smith interrupts his interviewees, takes a mobile phone call mid-talk and smirks at the camera. He also sports a disconcerting number of different hairstyles and looks throughout the film, which adds to Ultrasuede's hasty, thrown-together feel. In the end, he takes on a reflective, conciliatory tone towards his subject - but are those his authentic feelings or just another hipster-douchebag pose? Presented in 16x9 anamorphic widescreen, the new footage in Ultrasuede: In Search of Halston is pleasant if slightly blurred. The film also uses load of vintage filmed and videotaped footage sourced from degraded tapes, which have their own odd charm. Newvideo's DVD edition of the film sports a good, well-balanced stereo soundtrack available in both 5.1 surround and 2.0 digital. The film is clearly mixed with a satisfying balance between dialogue and music. No subtitles are available. Two brief featurettes count as the disc's sole extras. An Interview with Director Whitney Sudler-Smith and Producer Adam Bardach Presented by American Express (3:20) doesn't delve very deep and comes across as typical EPK stuff. A deleted scene (1:45) has Sudler-Smith seeking advice from his friend, a staffer at GQ magazine who suffers from the same flippant attitude as his good buddy (insert vomiting sound here). Loving tribute to an overlooked fashion icon or hipster ego trip? Ultrasuede: In Search of Halston attempts to have it both ways. While it's a fun and slickly made trip back to the '70s and '80s, director Whitney Sudler-Smith's attempts to shoehorn his own personality into the proceedings make it a non-essential curiosity. Halston was a great designer and true visionary worthy of an excellent documentary; this isn't it. Rent It.